KUALA LUMPUR (Dec 16): The FBM KLCI fell 23.37 points or 1.38%, as concerns on lower crude oil prices weighed on investors. At 5pm, the KLCI closed at 1,673.94 points. The KLCI declined on losses in stocks like SapuraKencana Petroleum Bhd and RHB Capital Bhd. 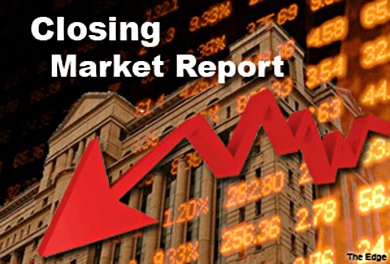 The KLCI had extended losses, after yesterday's 35.68-point or 2.06% decline. Today, Maybank Investment Bank Bhd regional chartist Lee Cheng Hooi said the KLCI movement's mirrored the US' Dow Jones Industrial Average overnight performance, as well as the decline in Asian markets today. According to Reuters, sliding oil prices and a downbeat China factory survey weighed on Asian shares today; while the rouble jumped against the dollar, after Russia sharply increased its benchmark interest rate, in a desperate bid to halt a collapse in its currency. Brent crude oil fell 37 cents to US$60.69 a barrel, while US oil dropped 36 cents to US$55.55. In Malaysia, Bursa Malaysia saw 1.64 billion shares valued at RM2.1 billion exchanged. Decliners outnumbered gainers at 572 against 296, while 275 counters were unchanged. The top decliner was British American Tobacco (M) Bhd, while Carlsberg Brewery Malaysia Bhd was top gainer. Meanwhile, oil and gas entity Sumatec Resources Bhd, which is linked to tycoon Tan Sri Halim Saad, was the most-active counter.